You'll be £16.99 closer to your next £10.00 credit when you purchase With British Snipers to the Reich. What's this? Captain C Shore's enthusiasm for firearms led him to take every possible opportunity to try out different weapons, ammunition and methods of shooting. The result of all his investigations is this practical guide to the sniper¹s art in World War II. His interest was combined with sound common sense and he would never consonance a rumour about a practical weapon or incident unless he was able to confirm it for himself. As a result, everything in this text is based on his personal experience. In World War II, Captain Shore took part in the British landings at D-Day and he fought in Normandy and Northern Europe. He came across many different weapons in varying conditions, some of the worst being those used by the Dutch and Belgian resistance fighters. He was keen to learn from experienced snipers and then to train others and he became an office sniping instructor at the British Army of the Rhine Training Centre. He shares a wealth of first-hand knowledge of different rifles, pistols, machine guns, ammunition, telescopes, binoculars, and all the equipment a sniper should carry. With British snipers to the Reich is not only an account of sniping in World War II but also a guide to all aspects of sniping based on personal knowledge and experience in training and in battle. 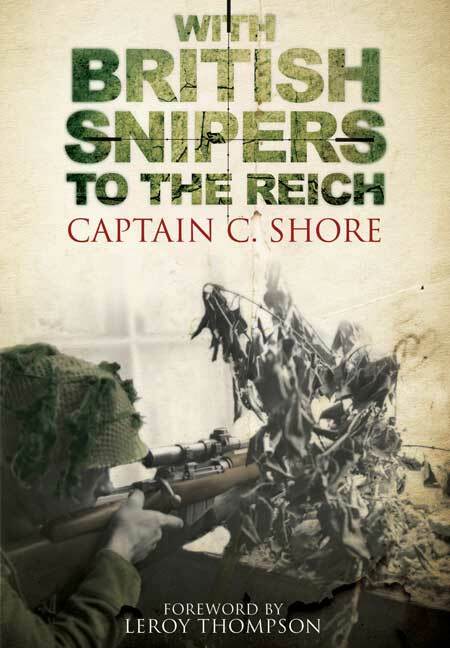 In this remarkably detailed insight, the author includes a history of british sniping up to the outbreak of war; sniper action in Normandy in 1944; descriptions of British and German sniper training, comparisons of the weapons used as well as much more. This is a reprint of a work first published in 1948 when things were still fresh in the author's mind and because of that we are most fortunate. He explains the techniques used to set up a shot, how to stalk and make the use of cover. His personal opinions of various weapon types is interesting, he did not rate the Italian Carcano rifle at all, and he expresses nothing but praise for the American sniping rifles. The term 'sniping' is used all too freely to describe sporadic firing and this book reminds us what it was about. Still fascinating. This account of sniping in WWII is a guide to all aspects of the discipline.